The standard line on Blur is that they were never able to crack America because they were just too English. They sing about super-British stuff that we just don't get, like "bank holidays" and how things are "rubbish" and something called a "quango" (look it up). Blur's one foray into the American rock scene, the 1997 single "Song 2" (known to MTV viewers and rock radio listeners everywhere as "the woo-hoo song") succeeded because it was a two-minute ball of pure energy, too short for Damon Albarn's acerbic Briticisms to assert themselves. Maybe Albarn and Co., who recently reunited as a complete band for the first time in nearly 10 years, are as British as tea and the Queen, but if that's why the American market hasn't given them the time of day we should think again. Actually, Blur has a lot to teach American bands when it comes to their ability to reflect national culture. 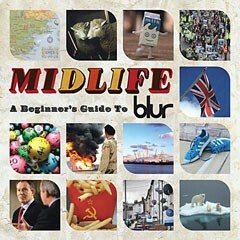 Midlife, the new 2-CD compilation released to celebrate the band's reunion, runs through the group's nearly 20-year career in all its Britishness, from the bouncy description of middle-class sexual hang-ups in "Stereotypes" to the spaced-out shoegaze meditation on the loneliness and isolation of life on a small island in "This is a Low." Midlife is what it says it is -- a beginner's guide to Blur, running from Britpop beginnings to electronic experiments of 2003's Think Tank. Comprehensive as the disc is, however, it's hard to justify Midlife's existence. For fans, it's almost completely unnecessary, including only one song that was previously hard to find on CD ("Popscene," a 1992 non-album single). For true newcomers to the band, 2000's Blur: the Best of is a more concise introduction, and really, a copy of 1994's Parklife goes much further in articulating what makes the band special than any compilation could. Blur isn't the first British band of the ’90s to come out with a redundant release like this (EMI is currently trying to squeeze every drop out of the Radiohead catalog with their reissues), but it feels like the most purposeless -- there is no need for greatest hits CDs when fans can create personal greatest hits playlists. Does anyone want to pay for a record company's opinion about what a band's best work is? If I were curating this comp, I'd add "Charmless Man" and "Bank Holiday," and ditch "She's So High" (the band's first single, which doesn't do a lot for me) and a few others. But of course, I can do this by loading up all my Blur records in iTunes. Midlife is a solid introduction to an important band we've ignored for too long, but the best bet is still, as is almost always the case, to pick up one of the band's old records.